Will the Red Sox buy or sell before the July 31 non-waiver trade deadline? The likely answer to this widely discussed question across New England will become clearer in the club’s eight games leading to the All-Star break. As the season has reached the official halfway point of 81 games, they are 37-44 and six games behind first place Baltimore and New York in the American League East as well as six games out in the wild card standings. Boston opens a three-game series tonight against the surprising Houston Astros at Fenway Park before hosting Miami for two games and then wrapping up the pre-ASG homestand with a three-game set against the New York Yankees. If the Red Sox do no worse than 5-3, they will enter the break at 42-47, a record that will probably keep them within seven games of the AL East leading team. That would likely inspire Red Sox general manager Ben Cherington to make upgrades. Should the club fall into another prolonged losing skid – say losing all eight or dropping six out of eight – the funk might lead the front office to unload players who are not part of the organization’s long-term future. On Wednesday, multiple media outlets reported that a major league source said the Red Sox are on the hunt for young starters and relievers who are under team control beyond this season. Since last offseason, Boston has been linked to Philadelphia left-hander Cole Hamels, but Hamels is 31 and is owed $70.5 million in future salary. The Red Sox are also believed to have interest in Cincinnati right-hander Johnny Cueto, but the 29-year-old right-hander can become a free agent at season’s end and will undoubtedly command a hefty contract in terms of length and annual salary. Out of Boston’s current starters, Rick Porcello ($20 million), Clay Buchholz ($13 million club option) and Wade Miley ($6 million) are the names most likely to be part of the rotation next year. Eduardo Rodriguez, who has been impressive in his first seven Major League starts, will likely join that trio, leaving only one rotation spot – the No. 1 role. The Red Sox have one of the game’s best farm systems and are rich with top prospects that can be used to yield Hamels or a well-respected young arm that is currently in the majors or deemed major league ready. Hamels would immediately slot into Boston’s No. 1 rotation spot, and he is signed to what is now considered a team-friendly salary structure in terms of remaining years compared to offseason deals inked by names like Jon Lester and Max Scherzer. Yet the Phillies ace would cost Boston a more premium package of prospects than if they traded for a young, high-ceiling starter. Since the Red Sox endured a seven-game winning streak that ended with a win against Atlanta on June 16, they are 10-6 and have seen improved performances from the rotation and the lineup. 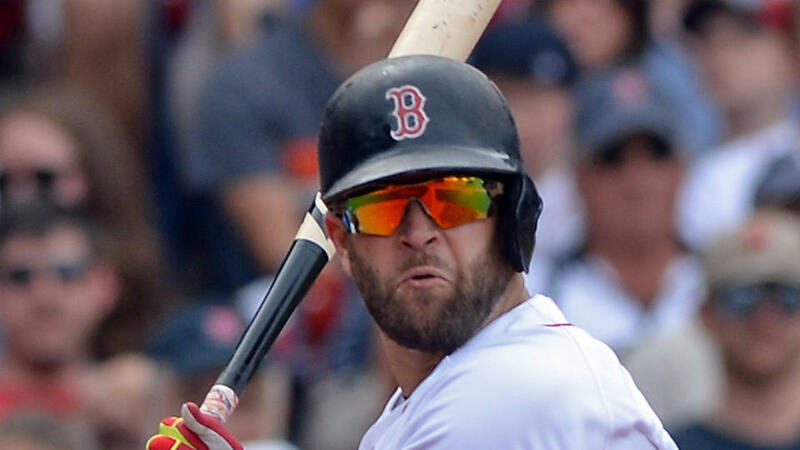 The lone regular who continues to struggle is right-handed hitting first baseman Mike Napoli, whose contract expires at the end of the season. He has 10 home runs, but only two over his last 30 games (97 at-bats), and overall he has a .199 average and a .674 OPS. If the organization had a viable replacement in on the big league roster or at Triple-A Pawtucket, Napoli would have likely been cut loose by now. Allen Craig, who batted .135 (7-for-52) for Boston before he was sent to Pawtucket earlier in the season, is batting .282 with a .403 on-base percentage, a .382 slugging percentage, a .786 OPS, three home runs and 12 RBI in 181 plate appearances at Triple-A. Now 30, the right-handed hitting Craig has $20 million in guaranteed money remaining over the next two seasons beyond 2015 (plus a $1 million buyout or a $13 million team option in 2018). Seemingly, the Red Sox would have already summoned the former National League All-Star if they felt he has regained his stroke that produced a .315 average, 13 home runs, 97 RBI for the St. Louis Cardinals in 2013. Craig remains an option at first base if Napoli continues to hover around the Mendoza line, or Cherington could look to acquire someone. As long as the Red Sox continue to rebound from their dismal start, they will look at add a top of the rotation arm and a power arm in the bullpen. Closer Koji Uehara, and primary set-up men Junichi Tazawa and Alexi Ogando, are pitching effectively. Tommy Layne is providing manager John Farrell with a dependable left-handed option, holding opposing hitters to a .222 average (including a .174 mark against lefties). Beyond those four, the pen is shaky. Rookie Matt Barnes, who was transitioned from a starter to a reliever this season, has a 4.58 ERA and a 1.78 WHIP in 17 games, and opposing hitters have a .337 average against him. Left-handed batters have a .297 average against veteran left-hander Craig Breslow, and righties are hitting .286. Robbie Ross Jr., who the Sox acquired last offseason from Texas for starting pitching prospect Anthony Ranaudo, has a 4.28 ERA, a 1.50 WHIP, a .286 batting average against and a gaudy 5.23 ERA versus left-handed batters. Interestingly, if the Red Sox carry momentum into the All-Star break, they will probably add a bullpen arm. If they return to their losing ways, Uehara, Tazawa, Ogando, Layne and Breslow are all trade candidates. Right-handed pitcher Justin Masterson, Napoli, outfielder Shane Victorino and fellow outfielder Alejandro De Aza (who is batting .338 with a 1.034 OPS, five triples, three home runs and 16 RBI since Boston acquired him from Baltimore on June 3) are in the final years of their contracts and could be trade targets of contending teams if Boston falls out of contention.